This fan made soundtrack is gifted to us by a friend of the website. It is very well put together and worth the listen. Here are the notes from the original uploader (djsmokingjam). Ganja & Hess is a film that once you see it, whether you like it or not, sinks its claws into you and doesn't let go, its images haunting you for a long time afterward. 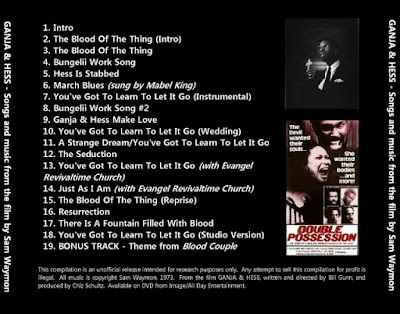 But even more haunting is the music from the film - Sam Waymon (younger brother of Nina Simone) creating an innovative, ahead-of-its-time mixture of soul, tribal chants, gospel and trippy, dissonant experimental cues that makes for the strangest score for a vampire film outside of Donald Rubenstein's jazzy accompaniment to Martin. 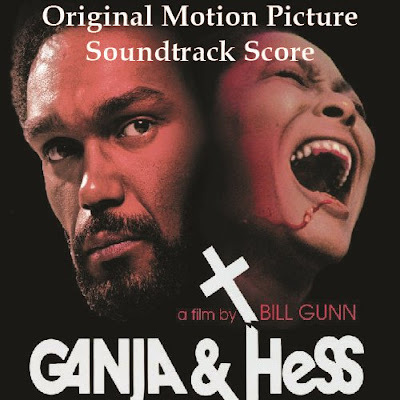 Waymon also appears in the film as a preacher who moonlights as a driver for Duane Jones' infected Dr Hess Green. a) As you might expect from this sort of thing, sound effects and dialogue recur throughout. I think it works quite well, however; Gunn and Waymon obviously put a lot of attention into the soundscape of the film, and it shows. b) Obviously, I was limited not only by my own inexperience when it comes to audio, but the crumminess of the source materials. Although I took the audio straight from the DVD (and did nothing more but raise the volume slightly via Goldwave), that DVD is itself taken from a few different old 35mm prints, since the negative was destroyed in the creation of the Blood Couple re-edit. In addition, some audio was sourced from the DIVX rip of Blood Couple available onsite - contrary to popular belief, the re-edit did not completely dispense with Waymon's score. c) Track titles, as usual for this sort of thing, are mixed between those made up by me, and the proper names lagely gleaned via the excellent essay by Tim Lucas and David Walker included in the DVD-ROM folder of the 2006 DVD. 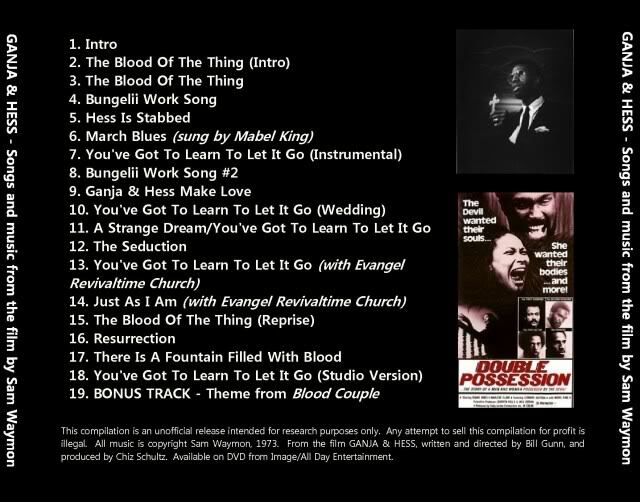 Great soundtrack! thanks for sharing. Can you repost this please!